With so many electrodes on the market, selecting the right one for the job can be challenging. Choosing poorly can result in increased spatter levels, cracking and an overall problematic welding technique. Welding Industries of Australia’s (WIA) Austarc 16TC, Australia’s number one best-selling electrode, features reduced spatter levels, high operator appeal and a low hydrogen classification. Find out why the 16TC is the electrode of choice for professional welders across Australia. A major challenge for welders when using electrodes is their difficulty to start and operate. The main cause of this is the materials that are used in the manufacturing process. Manufactured in New Zealand, the Austarc 16TC differs from other electrodes in that it is twin-coated. Typically, with low hydrogen classification electrodes the ingredients used in the flux coating make the electrode difficult to start, run and operate. This is where the Austarc 16TC stands out from other low hydrogen electrodes. The 16TC twin-coating manufacturing process puts the ingredients that make the electrode difficult to start and run in the outer coating, leaving the arc friendly ingredients in the inner coating. It is this unique feature that results in the 16TC being the smoothest and easiest to run electrode on the market. Not only is the Austarc 16TC the electrode of choice for professional welders, but many young aspiring welders begin their welding career using the Austarc 16TC. As the Austarc 16TC is much easier to operate than electrodes of the same classification, Australia’s leading colleges and welding schools use the electrode in technical exams. The operator friendly features of the Austarc 16TC gives the students a higher chance of passing their exams and makes the welder familiar with the best-selling electrode from day one of their welding career. Suited to almost all welding positions, the 16TC is conveniently manufactured in a variety of weights and sizes and is commonly found in many different sectors, including construction, maintenance, repair, structural and fabrication. A further issue with low hydrogen electrodes is that they usually require more power to initiate. An additional benefit of the twin-coated design of the Austarc 16TC is its ability to function when there is a limited power supply, for example in rural areas, where many other branded electrodes struggle. A common issue in arc welding is the occurrence of spatter. In all welding operations a key priority is to limit post-weld clean up time by reducing the amount of spatter. Poor quality welding electrode causes increased spatter levels. To limit spatter levels the Austarc 16TC is manufactured using only the highest quality materials. This includes a 100% steel core. The high purity of the Australian steel delivers a deposited weld metal that is cleaner and free of impurities. Leading to a tidier, stronger and more reliable weld. In addition, by increasing the ease of operability, the Austarc 16TC is designed to get the most out of welders by enhancing their technical ability, leading to a more accurate weld. WIA has been supplying the Australian welding market for more than 50 years. Trusted by the very best, WIA has a dedicated team of technical experts on hand to advise and assist all of its customers. Since its development in the 1960s, the Austarc 16TC continues to be the number one best selling electrode in Australia. The twin-coating technique has often been imitated but no one has come close to producing an electrode that is as easy to operate as the Austarc 16TC. 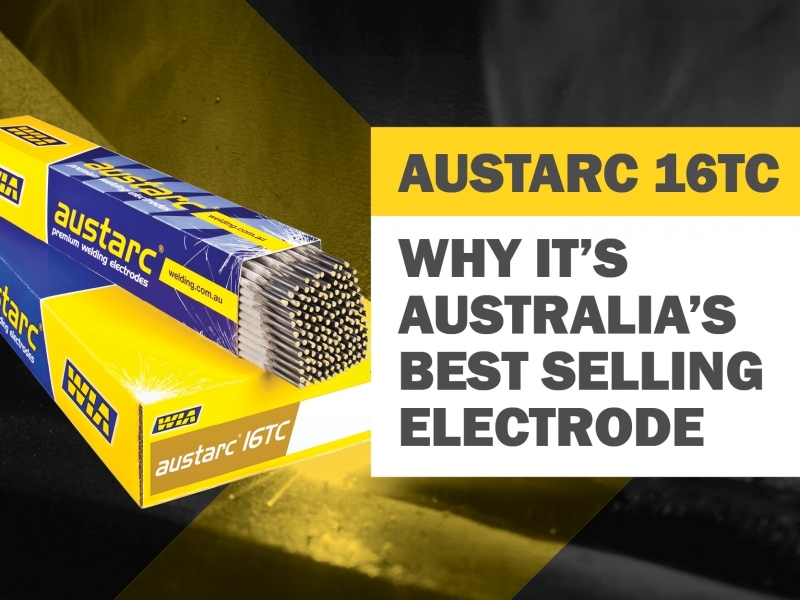 Relied upon across Australia’s entire welding industry, the Austarc 16TC remains the leading electrode of choice.